Although zuccini is not the English name, my first exposure to this cake was under the employment of an Australian cafe owner, and therefore I wish to respect my initial discovery of this recipe from my fun days working at 232 in Bristol, which is actually where my interest in food began to grow. 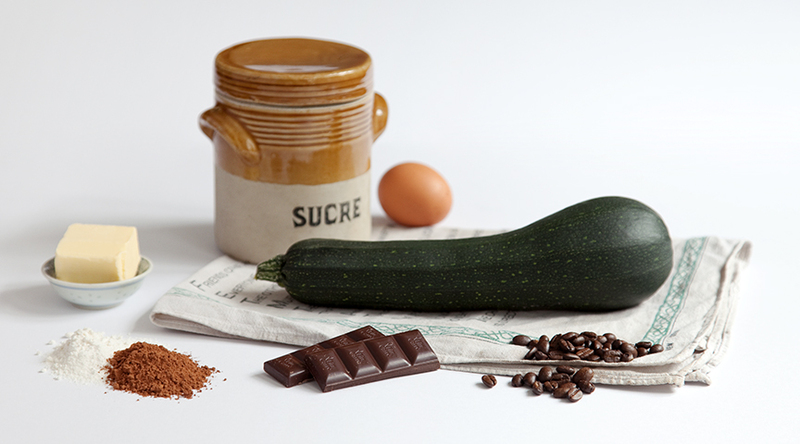 The foreign name can add some mystery to the cake, as some people will not know that a zuccini is actually a courgette. It’s sometimes fun to have people enjoy the cake before revealing to them what it’s actually made of, particularly with kids, which I had the opportunity to do when teaching gardening at a primary school this past year. Me and six children made the cake and kept its contents secret, after the whole class had eaten and enjoyed the cake, we revealed the secret ingredient and about half of them put their hand up when asked if they wouldn’t have eaten it knowing what was in it! We used our own school-grown crop, it’s one of the easiest vegetables to gain success with. In fact it would be fair to say we ended up with too many, which is why recipes exploring all the different things you can make with a courgette are much sought after. 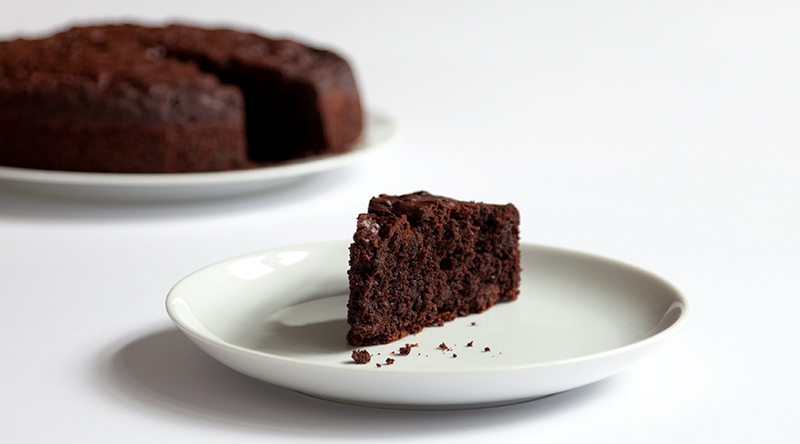 The recipe ratios here are narrowed down to the nearest whole egg, a two-egg mixture is about enough for a bread tin, to fill a normal cake tin use three or four. A long cooking time is needed because the courgette contains so much moisture, if you use this recipe to make fairy cakes, experiment with a shorter cooking time. You’ll be using three bowls, large are best but if you have bowls of different sizes, the second bowl needs to be the largest, as everything will end up in there before you transfer the mixture to the tin. 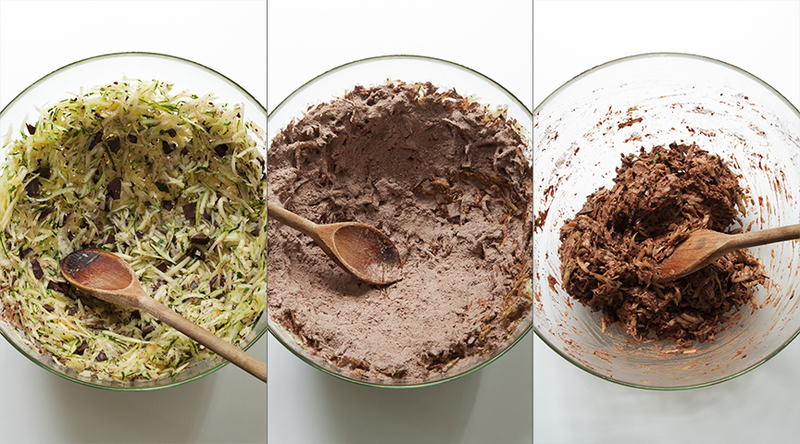 The separate bowls are needed to ensure even distribution of flavour; well-mixed dry ingredients need to be added to the grated courgette so that the pieces get evenly coated in flavour, otherwise the cake would end up having clumps of savoury courgette in it. If you store your butter in the fridge, start by slowly softening it in the oven at around 50 degrees. While it’s warming, begin with bowl #1, which we can call the flour bowl. 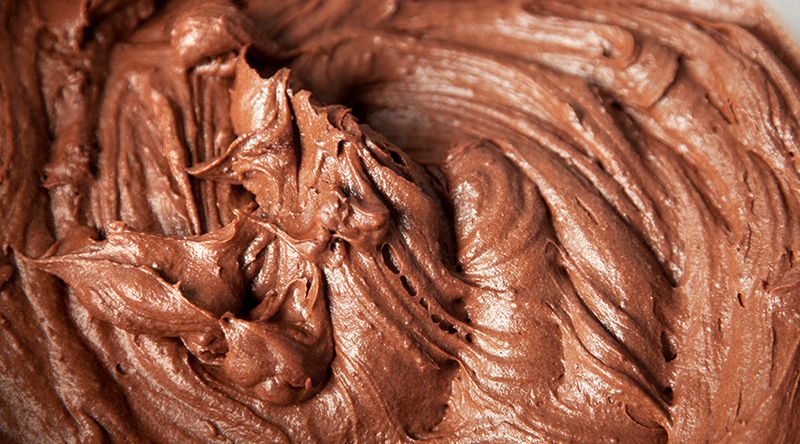 Start with the cocoa so you can eliminate any lumps before you add the other ingredients. Bowl #2 (the large bowl) we will name the egg bowl. After beating the softened butter with the sugar, add and beat one egg at a time. If your courgettes have swollen in to marrows you can still use them, but remember they will weigh a lot less when you’ve scooped out the seed-filled middle, so you’ll need more than you think. You don’t need to skin the courgettes unless you want to, but the skins of marrows are usually tougher so it’s best to remove them and again this will lower the weight. 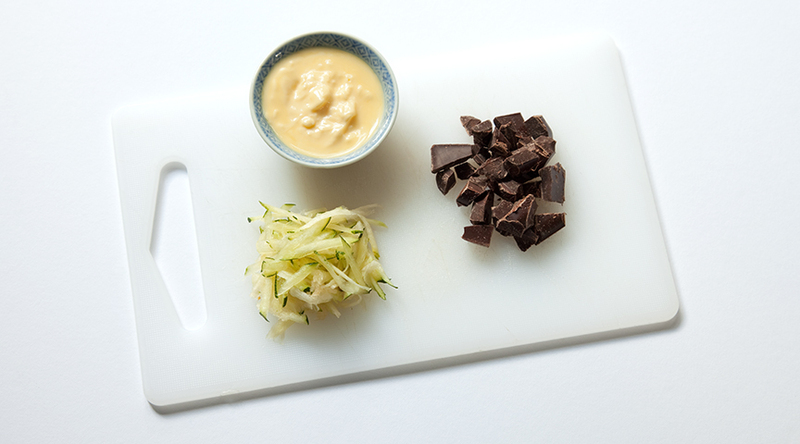 Grate and add with coarsely chopped dark chocolate to bowl #3, the courgette bowl. Spread the courgette up the sides of the bowl to make as thin a layer as possible, then distribute the contents of the flour bowl over this surface until all green is covered (probably using about half of the flour blend), then mix to distribute. Add the rest of the flour blend to the egg bowl, mix thoroughly in to a lovely silky consistency, then add the courgette blend and incorporate before transferring to a greaseproof paper-lined cake tin and chucking in the oven! Add ½ flour blend, mix to coat courgette. Incorporate, transfer to tin. Oven 170c (fan) 100 minutes. Works fine with a gluten-free flour blend. This entry was tagged Bake, Baking, Baking powder, Butter, Cake, Chocolate, Cocoa, Coffee, Courgette, Egg, Flour, Gluten-free, Sugar, Vanilla, Wheat flour, Zuccini. Bookmark the permalink.